We asked what you wanted to know about our house before we moved. You know, so we weren’t going back and forth between old and new. Catie wanted to know how we planned my office and how we built the bookshelves. So here’s the story. (Of a lovely lady. She was bringing up three very lovely girls. Who else loved the Brady house, especially the staircase?) Really now, here’s the story. Before I met and married Ben, I was a real estate agent in Minnesota selling condos for a builder. After moving to Montana, the builder had a few slightly damaged (free to us) doors, so my parents brought them out for us. We received 9 doors, including a set of French doors. We loved the doors, and the only place we could use the French doors was my office. All other doorways were too small. Like most rooms, my office has four walls. One wall had French doors, across from that is a small-ish window. I needed a desk space and wanted a wall of bookshelves. The only logical place for the bookshelf was to the right upon entering. It seemed natural to have my desk under the window. So the general layout was simple. When it came time to build the desk, we looked all over for something to run the length of the desk wall with no luck. That’s when Ben proposed the idea of a raised work surface and a lower desk. That’s just crazy enough to work! Not only would a taller work surface prevent back pain from bending over, but I’d also get more cabinet space. Win, win. We found a remnant of white marble for the desk and a long slab of Brazilian cherry for the counters and got started. Of course one can never have too much storage, so Ben built shelves above the desk. Building the bookshelf actually wasn’t much different from our kitchen cabinets. To start, Ben made three boxes from 2 by 4 boards on end, just like the cabinet toe kicks. These three boxes sandwiched vertical pieces of MDF. You can kind of see it in this picture, the 2 by 4s are just covered by 3/4 inch MDF. After getting everything placed right on the floor, Ben did the same thing along the ceiling. Now we didn’t have to worry about the verticals shifting. Then we started placing shelves. If you want adjustable shelves, you can either buy metal strips or shelf support pegs. We decided against adjustable shelving, so Ben cut 1 1/2 inch wide strips from a 3/4 inch thick sheet of MDF. I determined the spacing and he put one support on each side of the shelf. To cover the exposed edges, Ben cut strips of 3/4 inch MDF and nailed it to the fronts for a seamless look and capped the top with crown moulding to match the rest of the room. Fill, sand, prime, and paint until you feel your hand is going to fall off. Then pack stuff in and have fun arranging and rearranging. If you can’t or don’t want to build shelves completely from scratch, why not spruce up store-bought shelves with a little trim? Kate, Jen, Julia, and Jenny all have with excellent results. I love that a little trim and paint can make a totally custom look from a box store shelf system. If you’re renting, you can make a stand alone system and take it with you when you go. Have you ever built a bookshelf? Or modified a store system for a completely custom look? Do you prefer fixed or adjustable shelves? Have any other questions? Either about my office or anything else in our current house? We want to tie up any loose ends before moving, so if you’ve wondered about a project, now is the best time to get it off your chest. I so love your office! The built-ins are so great. 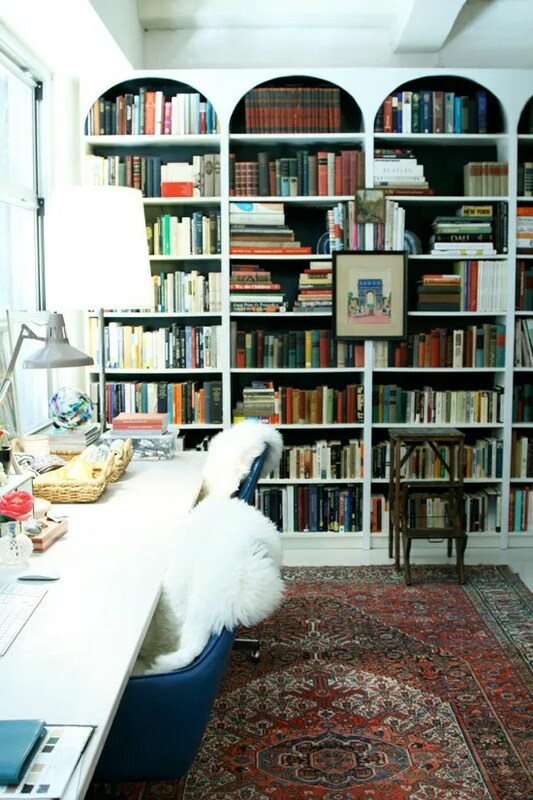 I could use more bookshelves in our office space. Do you plan to have a similar layout in your new home, or will you start from scratch? Thank for your tutorial!!! So you guys actually made the cabinets that go under the workspace as well. I was wondering about that! I love how your office turned out – so much wonderful storage for a smallish space! Where did you get that neato light fixture?